I recently published "The Middle East Runs out of Water," a survey of the region's acute hydraulic problems with a kicker at the end how Israel has, in less than a decade solved its shortages. This weblog entry notes interesting developments on these complementary topics. May 11, 2015 update: Neighbors in the Middle East may not be ready to learn about water from Israelis but Californians are: some projects (such as the $1 billion desalination plant IDE Technologies is building to provide 50 million gallons of water daily in the San Diego area starting in November) are already underway and many, many more are in the works. Precipitation has fallen 20% in Iran in the current water year (183 millimeters vs. 229 millimeters in the previous year). More than 500 Iranian cities are struggling with drinking water shortage. The regime earmarked $10 billion to harness cross-border water resources. A former minister of agriculture calls the water crisis "more dangerous than Israel, America, or political fighting," and suggested the Iranian plateau will soon become uninhabitable. The UN has labeled water Iran's "most important human security challenge in the coming decades." 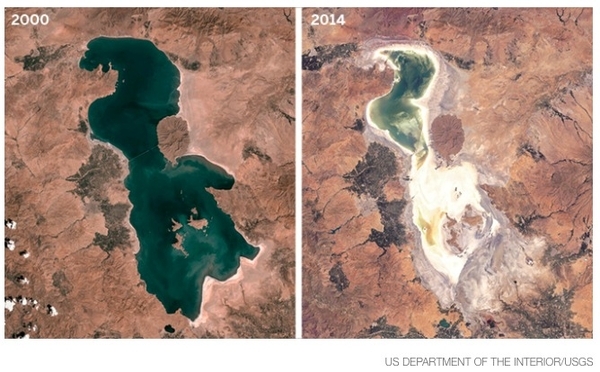 Sep. 2, 2015 update: Space pictures show the contrast between Iran's Lake Urmia in 2000 and 2014. Iran's Lake Urmia is disappearing. Desal works by pushing saltwater into membranes containing microscopic pores. The water gets through, while the larger salt molecules are left behind. But microorganisms in seawater quickly colonize the membranes and block the pores, and controlling them requires periodic costly and chemical-intensive cleaning. But [the Israeli] developed a chemical-free system using porous lava stone to capture the microorganisms before they reach the membranes. 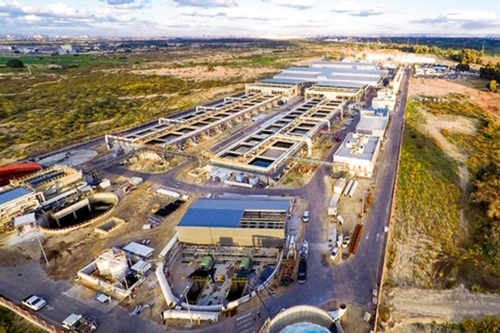 The new Sorek desalination plant, south of Tel Aviv, the largest reverse-osmosis desalination plant in the world. Water produced by desalination costs just a third of what it did in the 1990s. Sorek can produce a thousand liters of drinking water for 58 cents. Israeli households pay about US$30 a month for their water — similar to households in most U.S. cities, and far less than Las Vegas (US$47) or Los Angeles (US$58). Aug. 9, 2016 update: Susan Abulhawa, a novelist, amusingly attempts to rebut the Scientific American article today at "Israel's desalination miracle, Santa Claus and other fairy tales" in Middle East Eye. From plain factual inaccuracies (claiming that Jerusalem's rainfall exceeds that of London) to polemical outrage ("Israel's water regime functions synergistically within a larger context of Jewish exclusivity and Palestinian negation"), Abulhawa tries to pull down the monumental achievement that is Israel's water regimen. Particularly corrupt is her comparing water in the land of Israel today with how it was many decades ago, for example, quoting a travel guide from 1891, when the area's population was about 5 percent of what it is now. A more useful comparison, which she conspicuously does not make, would be Israel vis-à-vis its neighbors, such as Egypt, Gaza, the West Bank, Jordan, and Syria. Comment: Maybe she and her ilk would to better to help build Palestinian water supplies than denigrate Israel's? Sep. 16, 2016 update: Is Tunisia heading for a "thirst intifada"? Could well be. See the analysis by Perrine Massy. Farmland is too parched to cultivate crops and rural protesters have tried disrupting water supplies to the capital, while one legislator is calling for a "thirst revolt." A lack of rain, combined with years of bad resource management, has left reservoirs and dams at exceptionally low levels that could lead to a "catastrophic situation," said Saad Seddik, who was agriculture minister until last month. Tunisia has long had water issues, but what's unusual this time is that regions across the country, from north to south, are being hit. The drought is also worsening social tensions, already simmering because of chronic unemployment. The town of Fernana has seen weeks of unrest since a young man set himself on fire in desperation - mirroring a similar act in 2010 that unleashed the Arab Spring protests that overthrew Tunisia's president. This time, the Fernana protesters took out their anger at the establishment by converging on nearby dams and briefly cutting off water supplies to the capital, Tunis. In another town, Mateur, 70 kilometers from Tunis, protesters angry over a lack of water blocked a road for two days earlier this month and burned tires. Police cleared their roadblock, but water cutoffs continue. The new delay will do little more than postpone the crisis, especially as drought conditions are expected to continue for many years. The Iraqi government has been talking about the water crisis for a while but has revealed no proposed solutions and has taken no observable measures to control the vast water waste by some farmers. For Iraq to maintain the water allocated to irrigation, it has to abandon ... traditional methods used since the Sumerians ... and adopt drip irrigation instead, as it will help save huge amounts of our water. If no solutions are [found], agriculture in Iraq as we know it will end. Already, Saadoun notes, agriculture "has been severely harmed in the past few weeks and ... Iraq's current reserve can only cover 50% of the summer irrigation plan laid out by Abadi's government." June 21, 2018 update: Salah Nasrawi writes in Al-Ahram that Baghdad "decided last week to ban farmers from planting rice and other water-intensive crops in the face of increasing water shortages because of drought and shrinking river flows." upstream dams in Turkey, Syria and Iran have shrunk the rivers and their tributaries, seasonal rainfall has dropped and infrastructure has fallen into disrepair. The result is an acute lack of freshwater that has allowed a salty tide from the nearby Persian Gulf to advance north from the Shatt al-Arab waterway — the confluence of the Tigris and the Euphrates that Basra residents depend on — and seep into once-lush farmland. Sep. 6, 2018 update: A combination of Iraqi incompetence and Turkish/Iranian dam-building leaves southern Iraq"on the brink of catastrophe," writes Jacques Neriah. The country has less than half the water it used to have. Imagine the consequences. Jan. 24, 2019 update: "Subsidence" is the term of art for Iran's acute problem of sinkholes, fissures, and sinking, reports the Associated Press. Subsidence, notes Siavash Arabi of Iran's cartography department causes "destruction of farmland, the cracks of the earth's surface, damage to civilian areas in cities, wastewater lines, cracks in roads and damages to water and natural gas pipes." Iranian authorities say they have measured up to 22 centimeters (8.6 inches) of annual subsidence near the capital, while the normal range would be only as high as 3 centimeters (1.1 inches) per year. Even higher numbers have been measured in other parts of the country. 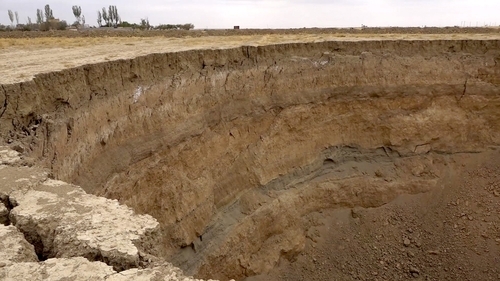 Some sinkholes formed in western Iran are as deep as 60 meters (196 feet). ... "In European countries, even 4 millimeters (0.15 inches) of yearly subsidence is considered a crisis," Iranian environmental activist Mohammad Darvish said. A sinkhole in western Iran in August 2018.